Santosh is mature beyond his years. 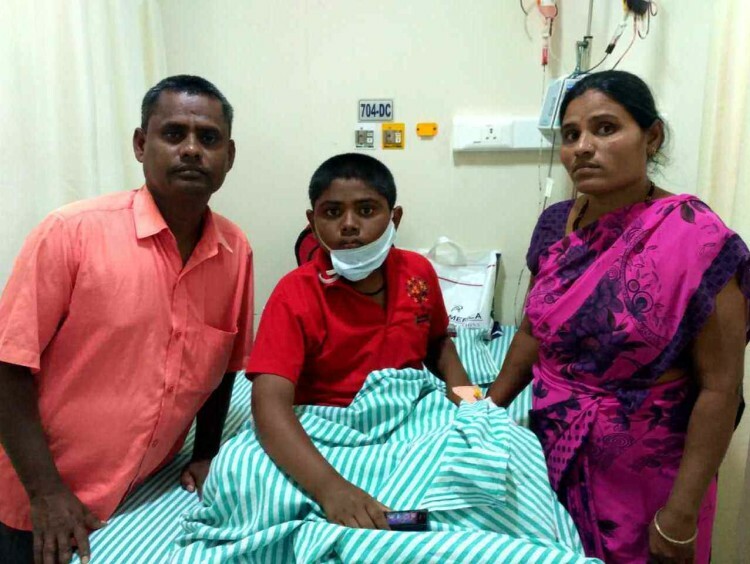 When his parents, Satish and Parvathi, find it difficult to converse with the doctor, Santosh (13) takes over, even asking questions about his own treatment. Santosh is too young to realise that he may be facing death. Unfortunately for him, blurred vision, bleeding in his gums and fatigue have been a part of his life for 2 years now. With each passing day, Santosh is getting weaker because of this deadly blood disorder that’s more debilitating than cancer. 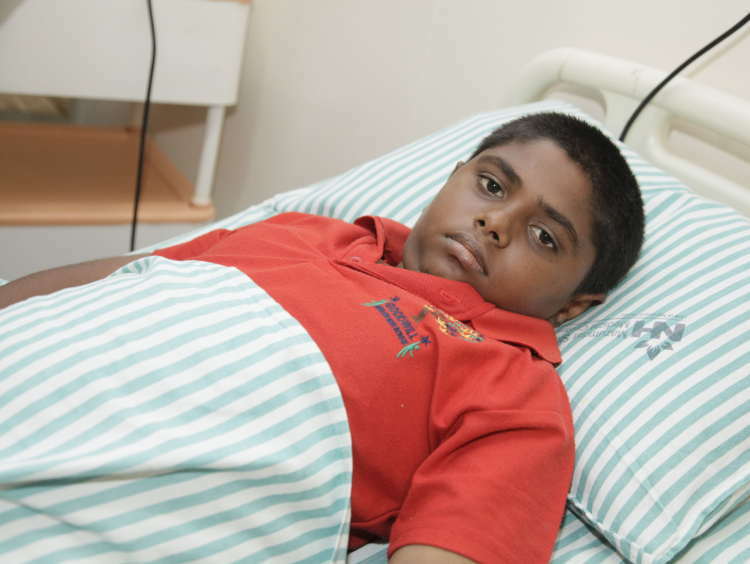 Santosh has aplastic anaemia, a condition in which his body can’t produce new blood cells. People with low platelet counts tend to bruise and bleed easily, and the bleeding is often hard to stop. For two years now, he has been living on blood transfusions and medication. Sadly, his condition has only gotten worse over the years. 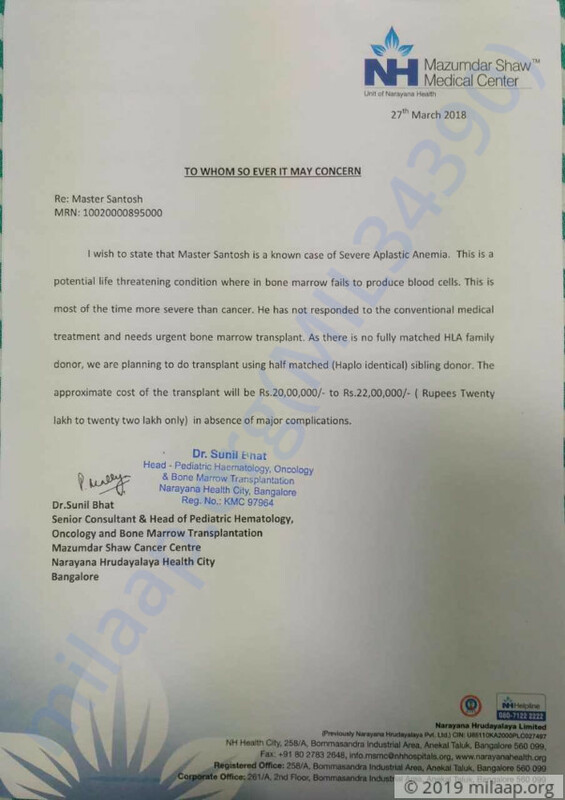 Now, only a bone marrow transplant can put an end to his suffering. “I’m only a labourer, I didn’t get a chance to finish studying, but I want both my sons to have a chance of a good future. Santosh is such a bright boy. When he speaks English, I feel so proud. I never thought that he would be forced to grow up so much so soon. He understands everything that’s happening to him. He knows that without treatment, he won’t make it. These are his years to learn and play. No child should have to understand death this early." Satish and Parvathi are both daily-wage labourers. They barely earn 200 a day and can’t afford to give their son the life-saving bone marrow transplant. On some days, even a blood test becomes a difficult task. Their son is slipping away from them, and they can do nothing but watch him struggle. 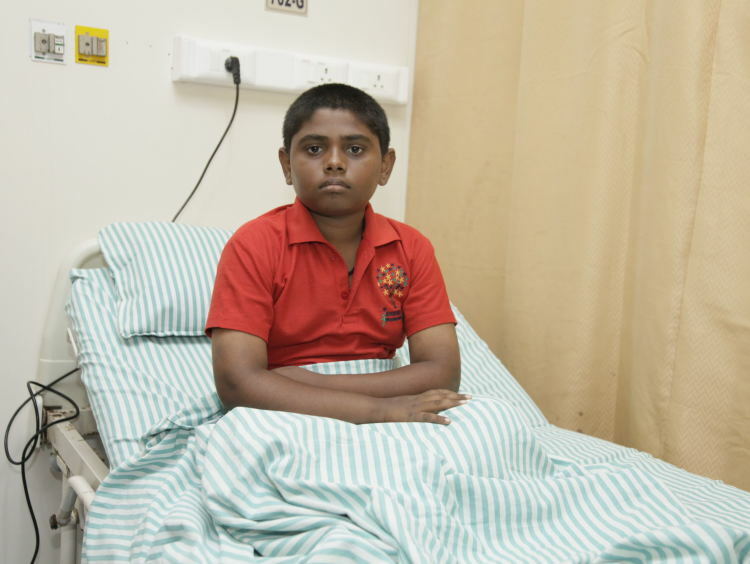 Santosh’s body can’t produce new blood and only a bone marrow transplant can save his life. Two years of blood transfusions have kept Santosh alive, but it hasn’t improved his condition. He needs the transplant soon, and his parents are finding it extremely difficult to get by. Santosh is their pride and joy, they need your help to save his life. Your support will save Santosh’s life. We have some unfortunate news to share. Santhosh passed away at home. He fought really hard but unfortunately could not make it. Thank you so much for your support. The funds will be utilized for his expenses so far. Santosh is currently undergoing blood transfusion as and when required. He is yet to undergo the main chemotherapy treatment. We are all hopeful about his recovery. Please keep praying. We shall keep you posted.